When he shook hands with the players and made his way into the innards of the Wellington Stadium, Bryce Lawrence had no idea his world was about be tilted off its axis. The Wallabies had just won a nail-biter against South Africa to advance to the World Cup semi-finals. At most it was a minor surprise. South Africa were defending champions but Australia had beaten them more often than not in the past two years. While Lawrence was getting changed into his civvies he wasn’t overly perturbed. South Africa captain John Smit, one of the game’s gentlemen, said the one good thing about retiring was he would never have to be refereed by Lawrence again. Two-time World Cup-final referee Andre Watson said Lawrence should never get another World Cup game and a mad theory that the Kiwi ref was doing his countrymen a favour by getting rid of their strongest opposition gained immediate traction. Galvanised, much like New Zealanders were against Wayne Barnes following the All Blacks quarter-final defeat in 2007, South Africans took aim at Lawrence and didn’t miss. Lawrence, 41, is phlegmatic about the malice from the public, disappointed about the jibes from Watson, but unforgiving of those who question his integrity. “The criticism didn’t hurt me that much because I know I didn’t referee as well as I should have,” Lawrence says. “It only really hurt when it became personal, when people started saying it was a fix-up and I’d done it so the All Blacks could get through. That hurt. “That’s an attack on your integrity and everything you stand for. The criticism that I should have refereed better, I totally accept. The son of Keith Lawrence, a highly respected but polarising ref in his day, Bryce Lawrence knows that when referees hit the spotlight it’s invariably for all the wrong reasons. Even knowing that did not stop him questioning whether the motivation to officiate at the top level again would return. The main problem with Lawrence has always been perception. He knows that. Sure, he might have missed Rocky Elsom’s hand in the ruck under the Wallaby posts, a decision which enraged the Springboks and their passionate fans, but few have major quibbles about the quality of Lawrence’s decision-making. It’s his manner that can rub people up the wrong way. Lawrence has never been blessed with a jocular mien; there are plenty of officials whose rapport with players looks more natural. “Sometimes it might come across that I’m taking it too seriously, but here’s the thing: I never feel I’m having an enjoyable, great day out during the 80 minutes. I feel it’s my job and I’ve got to dig in because it’s a hard job. “I get my enjoyment after the game if I’ve done what I had to do and I’ve done it fairly and well. Lawrence said refereeing is personality driven and the image of him as a bit brusque, a bit headmasterly, is a fair enough reflection of his character. “I’d say my personality is pretty direct. I wouldn’t describe myself as a laugh-a-minute person. I can’t go out on the field and be someone I’m not. “There’s a bit of a balance there and at times I can tend to go back to that default position of being too authoritarian, too blunt and too dismissive. I know when I do that and it’s not something I’m aiming to do, but neither am I aiming to be the players’ best mate. I don’t really see the benefit of running around with a big smile on my face if I’m getting every second decision wrong. You could spend your time worrying about how you’re perceived, but Lawrence, a trained schoolteacher, is past that. He listens to people such as Paddy O’Brien. So when the Southlander reviewed Lawrence’s performance in that quarter-final and found fault with his handling of the breakdown in particular, he found it easy to accept. Of that match, Lawrence says if he had his time again he would have changed his approach to the breakdown. It left a sour taste because Lawrence had refereed four pool games and had been pleased with how he controlled them. There’s an unwritten rule among referees that they don’t turn on each other in public. When you’re a sitting duck at the best of time’s why start shooting each other? That’s why Watson’s comments caused a ripple in the community. “I’ve known him for a long time and respect him for what he did as a referee. He was outstanding in his day. I know him well enough to know he has a strong opinion on things. 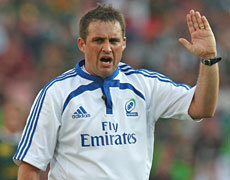 It’s another South African referee, Craig Joubert, who Lawrence thinks has set the new benchmark. It was Joubert who controlled the World Cup final and just to prove even the best have their moments, his performance has been criticised, particularly in the Northern Hemisphere, for being too lax on the All Blacks. Still, Lawrence says if he was a coach and his team was about to play a big game, it is Joubert he would like to see as referee. “If you were looking for the perfect mixture, I think [Steve] Walshie has got a great feel for the game, Paul Honiss was probably the greatest athlete and Paddy [O’Brien] had the best flair for dealing with players and letting it go a bit. It’s thinking about that, thinking about the pride in refereeing well that convinced Lawrence to train harder than ever this summer. Will he be more nervous than usual when he runs out for his first Super 15 game? “I’ve been thinking about that,” he admits. “I don’t know. I don’t want to go through what I went through after the quarter-final, but I’m the only person who can control that. “I need to get some self-confidence back, I need to enjoy myself, I need to referee well. Lawrence said his wife Claire and two daughters knew he was getting some grief, but he never revealed the full extent of it. Didn’t see the point. “The thing that scared me most was that people would really believe I cheated deliberately and fixed the game. The dishonesty thing. The fight for No 1, it’s all to play for!